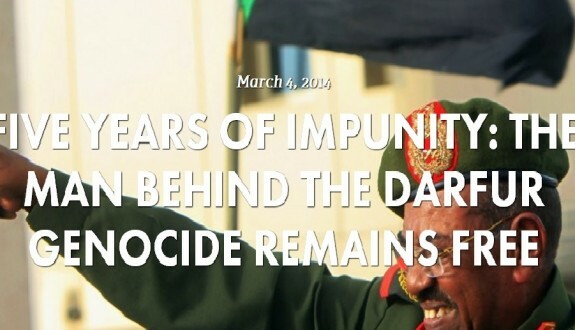 4th March 2014 marked the five-year anniversary of the first ICC arrest warrant against Omar al-Bashir for the atrocities he has carried out with impunity in Darfur, in the world’s longest running genocide. In attempt to make this the last anniversary of impunity, HART has joined 28 other civil society organisations in signing an Open Letter to the UN Security Council entitled: Five Years of Impunity in Darfur Must End. It calls for states to fulfil their legal and moral obligations under the Rome Statute and arrest Sudanese President Omar al-Bashir who is wanted by the ICC for genocide, war crimes and severe human rights violations. The letter demands that member states of the UN, the Security Council and the Rome Statute, honour their obligations regarding the ICC arrest warrant and implement the arrest if Bashir enters their territory. Other UN members are urged to arrest Bashir and transfer him to The Hague for trial. It reminds state that those who do not cooperate with the ICC arrest warrant are cultivating impunity and facilitating the continued abuse of civilians in Sudan. The letter encourages UN members to withhold military or economic aid (with the exception of humanitarian aid) from countries that allow Bashir to enter into their territory without issuing the arrest warrants. It also suggests that the UN considers implementing policies to enforce ICC arrest warrants in all UN-administered areas. The letter has been sent to the offices of the 15 members of the UN Security Council and the 122 countries that have ratified the Rome Statute. To read the letter and find out more, click here.